Contemporary built-in bathtubs are making a welcome style-statement in the master and family bathroom – offering comfort and luxury. They have come into their own and transcended mere functionality to become a beautiful feature in your private sanctuary. When it comes to inspiration for your bathroom, whether you are exploring a showroom or browsing through a design catalogue, a bathtub will always be the main element and starting point for any bathroom scheme. Whatever your style – be it modern, contemporary, classic, traditional, vintage or edgy – River Range’s built-in bath range will appeal to homeowners of all shapes and sizes. From the spaciously designed Amazon, to the Congo, with its rounded sophistication and curvy lines, right through to the gently sloped back Mississippi, a luxurious and relaxing bath time experience awaits. Seamlessly fitting into small apartments, right up to grand mansions, our ergonomically designed cross-linked acrylic built-in baths offer the homeowner a tantalizing blend of quality, versatility and style. With an endless range of creative options for the exterior – from marble and wood to mosaics and tiles – your built-in bath will be a beautiful and personalised focal point, adding colour and texture to the space. Once you have made your choice, all you have to do is sit back, soak and relax. Spatial considerations: Built-in baths offer wonderful flexibility when it comes to efficient use of space in bathrooms of any size. They come in all lengths and depths. To maximise space in smaller bathrooms, built-in bathtubs offer the dual purpose of a classic shower/tub combination. They also take up less floor space than freestanding baths and offer nifty storage for bath time essentials with their built-in ledges. Safety considerations: From a safety point of view, built-in baths are a practical choice for families with small babies and toddlers as well as for the elderly. They are more sturdy and are generally easier to get into and out of. For the safety conscious, these bath installations are a wise and pragmatic design choice. Budget considerations: In terms of pricing, built-in baths tend to be more budget friendly as they only have one finished side. This then affords you the creative space to go to town on cladding finishes and other bathroom designs elements, creating a truly personalised bathroom space. Cleaning considerations: Built-in baths win hands down in the maintenance department. It is much easier to clean around a built-in bath than the entire surface of a freestanding bath. With less scrubbing and more pampering, it affords you maximum time to soak and relax in a candlelit bubble bath. View our guide to efficient Installation and care for acrylic baths. 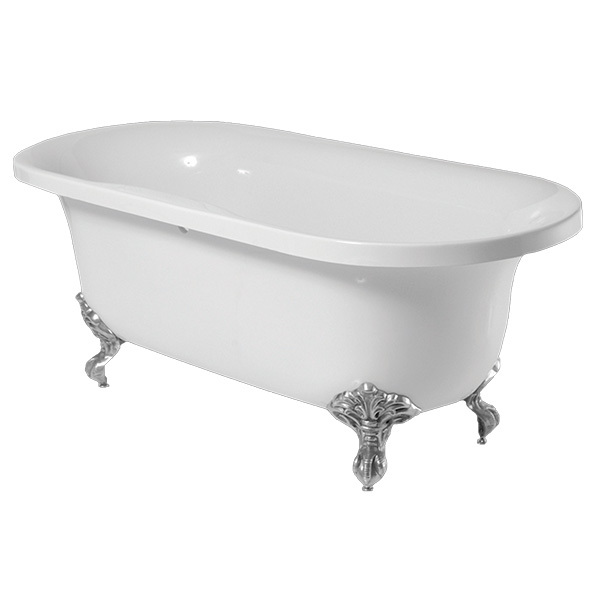 Style considerations: River Range is confident that our bathtubs will leave you spoilt for choice. From sleek and curvy to graceful, there is a style that is just right for you. Have a look at our latest newcomer, the Yukon built-in bath, which we featured in a recent blog. For further design impact, the addition of bathtub mixers and accessories create bespoke statement pieces that will definitely enhance your built-in bathtub. The Ingot range of bathroom accessories beautifully complements any River Range bathtub. River Range’s bathtubs are made from the best cross-linked acrylic available on the market, ensuring a tough yet beautiful high gloss finish. With ergonomically designed styles in various shapes and sizes, we aim to provide options to suit a wide variety of needs. Quality is of utmost importance to us with our baths being backed by a 10-year warranty. Please download our River Range brochure or visit one of our stores to make an informed and exciting design choice. It is always exciting when there is a new kid on the block. At River Range, we are proud to welcome Yukon, the latest addition to our built-in baths range; big brother to the popular Tugela model. The Yukon is available as a built-in or freestanding bathtub in 1700mm or 1800mm length configurations. In a previous Blog, ideas for built-in baths to dramatically improve functionality and relaxation were highlighted with regard to shaping your bathroom environment when it comes to design efficiency and inspiration. The River Range Yukon and Tugela built-in bathtubs have arrived in style, prompting the world of bathroom ware to sit up and take note with its new design, value for money and 10-year warranty. The sleek, straight lines of the Yukon and Tugela built-in baths offer ergonomic comfort and affordable luxury. Sophistication has certainly not been compromised in favour of functional built-in design options. From a purely practical perspective, built-in baths tend to be more economical when it comes to budget and spatial considerations; mostly due to the fact that only the exterior part of the tub is embellished with the finishing. This, however, is not a disadvantage, as the homeowner gains the extra freedom and creativity to personally bespoke cladding finishes – such as tiles, natural stone, mosaics or wood – the fairy godmother of bathroom finishes. Take the opportunity to exercise your creative license with a built-in bathtub transformation that refreshes and updates your bathroom to a whole new level. Built-in baths are also quite happy being the understudy, giving you further flexibility in choosing attractive bathroom fixtures and design elements to take centre stage in your bathroom. River Range’s high-quality built-in baths are manufactured from the best cross-linked acrylic available on the market. Also available is a vibrant selection of freestanding and corner bath models, providing a diverse selection of luxury bathing options to suit any bathroom renovation project. The River Range collection aims to strike a healthy balance between luxury and functionality. Our commitment to durability is backed up by a 10-year warranty on all our products. Best of all, River Range is affordably priced to ensure any customer can realize their dream built-in bathroom vision. Browse our current Brochure today to choose the option that best suits you while taking advantage of our online Store Locator to find a River Range distributor near you. Freestanding bathtubs offer an endless range of bathing options characterized by modern luxury and innovative styles. Unique shapes and contours are often artistic statements from the bath designers, with influences drawn, not only from the classical and Victorian era of cast-iron “ball and claw” baths but also from the natural wonders of our planet. In modern freestanding bath design, the heavy materials of the early 1900’s have been replaced by acrylic, making them lightweight ensuring superior heat retention. 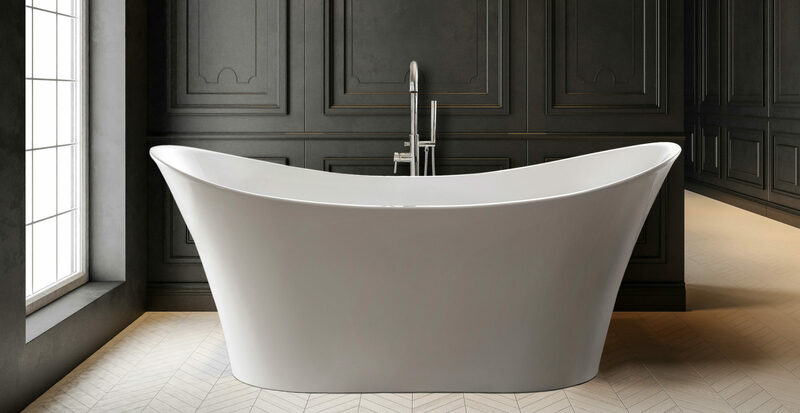 In our previous Blog, we explored the health benefits of a freestanding bath and we saw the combination of functionality and therapy through bathing as a tantalising prospect. Acrylic baths are a lighter and much more affordable option than denser materials, which allows almost anybody to enjoy long and leisurely baths in the comfort of their own home. In the home, art would traditionally refer to paintings, sculptures and other such decorative elements. However, in recent times, artistic flair has been incorporated into everyday home items such as sanitaryware. In line with this, freestanding baths have become the focal point, as they possess the ability to add unique character to your bathroom. An acrylic bathtub in the home, as perfectly illustrated by the spacious Kunene bathtub from the River Range freestanding bath range, merges modern luxury with the perk of a tranquil bathing experience. With such an exceptional price tag, it may be the most affordable art investment you’ve made for your home! There is a misconception that buying a luxurious bath is an expensive purchase. If you are restricted to a budget when finalizing the focal features of your home, an acrylic bathtub is an excellent option for creating an eye-catching design in the master bathroom at an affordable price. Quality is never compromised with the acrylic used in the manufacturing of River Range products. It is seventeen times tougher than glass while boasting excellent heat retention and chemical stability. Combining stylish freestanding bathtubs with an affordable price tag, River Range is a top quality, acrylic bathtub brand, offering the most luxurious bathing experience in the market. River Range also offers an array of corner and built-in bathtub solutions, all backed up by a 10-Year-Warranty as a testament to their quality and durability. Download our current brochure to view our wide variety of styles and make use of our Store Locator to find a River Range distributor near you today. Have you considered the health benefits of owning and enjoying a freestanding bath in your home? Yes, this might sound outrageous, but we are not just referring to the relaxing and rejuvenating experience one enjoys when unwinding in a hot bath to relieve the stresses of the day. Immersing your body in hot water has some serious health benefits which make it as much a therapeutic acquisition as it does, a beautiful focal point of your bathing area. In our previous Blog we focused on the allure of a corner bath this winter season but this month, we sink a little deeper and explore how effective a hot, steamy bath can be. It’s ability to relieve all sorts of physical pains and improve your circulation system. A freestanding bath might just be what the doctor ordered! If you suffer from back pain, the idea of lowering yourself into a bath can seem a daunting task. However, at the right temperature, a hot bath may be the equivalent of placing a hot pack on your back, targeting the source of pain and providing gentle relief. As back pain is generally muscular in nature – the warming of your skin may relax your aching muscles and provides some much-welcomed relief. 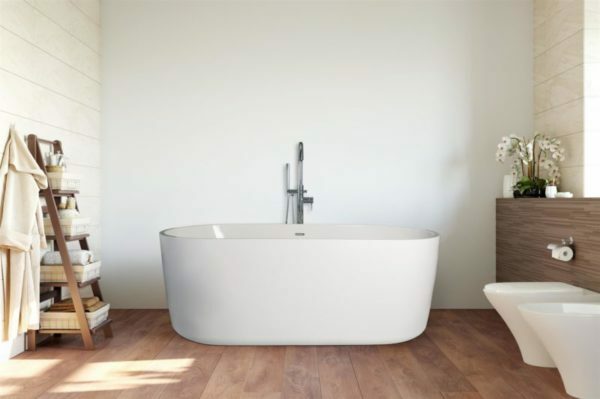 By bathing in a larger, freestanding bath such as the Danube or Gila baths, from the River Range freestanding bathtub range, you are allowed more room to spread out and soak up this warm relaxing treatment. Indeed, a hot bath, combined with a gentle massage, may go a long way in reducing pain and swelling and ultimately aid in a good night’s rest for you and your partner. Needless to say, a hot bath before bedtime is ample preparation for a good night’s rest. However, this strategy should be approached cautiously. The temperature of your freestanding bathwater is the key ingredient. Ensure the water is not too hot, as this can tire your body out and send your circulatory system into overdrive. Your body temperature naturally drops during the middle of the night. You can preempt this by soaking in a warm bath approximately an hour before you plan to sleep, to counteract your bodyclock and maximise your sleep. It’s precisely the time of year when Winter bugs ravage homes and offices around the country. One of the best health benefits of a freestanding bath is utilising the steam of a hot bath to try and fight off nasty viruses and doses of bacteria. The steam from bathwater may aid in opening up your nasal passages, providing gentle relief from horrible winter flu symptoms. In the meantime, your increased body temperature also allows your immune system to take its course, getting you back to peak fitness in no time! River Range, is a market leader in the South African luxury and affordable bathware industry, specializing in an elegant range of high quality cross-linked acrylic bathtubs with a 10-year warranty. With an offering of Freestanding, Built-In or Corner bathtubs, River Range products may just be the health boost that your home requires. Use our Store Locator to find a River Range outlet near you and follow our Facebook page to keep up to date with the latest news, tips and product launches. A corner bathtub is perhaps the most intelligent way to save space while adding a unique character to your bathroom space. All around us, it seems winter has made an earlier-than-expected arrival, making the appeal of a relaxing and luxurious hot bath all the more alluring. With the cold season looming, the bathtub becomes an enticing and relaxing retreat that may just become your favourite new spot in the house. In our previous Blog, we encouraged homeowners to make the most of the smaller bathroom in your house. A corner bath is an excellent design choice that blends well into any bathroom space with a generous incentive of comfort, stylish looks and durability to match. Making a small bathroom work can be frustrating, especially if you don’t know where to start. A corner bathtub is a perfect cornerstone (pardon the pun!) to solving your bathroom problems. Available in the three unique ranges, Euphrates, Angara and Parana, corner bathtubs ensure that you can have the benefit and functionality of a full bathroom without the risk of cluttering it. Corner bathtubs bring finesse to the room. With the essential part of the bathroom neatly tucked away, the centre of the space opens up, allowing for a free flow throughout the room and offering more spatial opportunities to add extra features. Now you have space for the shelves and accessories that you need in order to complete your dream bathroom. Installing a corner bathtub offers a different feel to the usual linear look that most homeowners take with their bathrooms. Being the room where you ready yourself to take on the day ahead, and the place where you unwind after a long day, your bathroom should be refreshing and aesthetically pleasing. The Angara corner bath from River Range is a luxurious rounded option that offers both functionality and style by utilizing that empty corner to bring charm into your lavatory. Leave the monotony of straight lines in the past. Who says a corner bathtub should be just that? With revamped access to water and drainage pipes, seize the opportunity to merge your new corner-piece with an adjoining shower with ease. It can conjure up all sorts of combinations to turn your bathing area into your ideal personal space. How incredible does that sound? River Range, a proudly South African company, offers top quality bathtubs made from the best cross-linked acrylic available on the market. In addition to their luxurious and stylish Corner Bath range, River Range also offers an array of freestanding and built-in bathtub solutions, all backed up by a 10 Year Warranty. With winter making its chilly entrance, bathers can be assured that all River Range products boast excellent heat retention – the perfect antidote for the colder months of the year. Download our current Brochure to view our wide variety of styles and make use of our Store Locator to find a River Range distributor near you today. Creating a stellar design idea for the smaller bathroom in your home may seem daunting from the offset. Naturally, one is restricted to space and the ability to accessorise the bathroom ahead of merely installing the functional requirements. However, we encourage you to take a different view of this room. In our previous Blog, we shared some tips towards achieving radical bathroom transformation in your house. For SA homeowners and DIY enthusiasts who love a challenging project, transforming the smallest bathroom house is that ideal opportunity to let your design juices flow, get clever on storage solutions and introduce a new built-in or corner bath ‘focal point’ to the room. Before you dive into the project, check out a few tips that will help you along the way. Perhaps you’re living in an apartment complex, and possess a built-in bath that has clearly seen better days. Tired of scrubbing stains that just won’t go away? It sounds like the perfect time to upgrade to a sparkling new built-in bath that truly satisfies and relaxes. Built-in baths have become more sophisticated than you think – choosing the right model helps to merge the overall theme of your bathroom refurbishment. If you prefer a linear bath with defined edges, the river-inspired Indus and Tugela models from the River Range collection provide a great base theme for the smaller bathroom that enhances the flow of your space, while offering a comfortable bathing experience for the whole family. If you are trying to decide between a bath or shower in the smaller bathroom, a corner bath (with the possible addition of a shower) might just be the perfect fit that cleverly opens up more space. It’s a great solution for those who don’t have the luxury of large space but yearn for a solution that provides maximum comfort and entices them to use the area a lot more. By combining a River Range corner bath such as the Angara or Parana models with a connecting shower head, you can turn/rejuvenate that mundane smaller bathroom of yours into quite a stylish home spa. 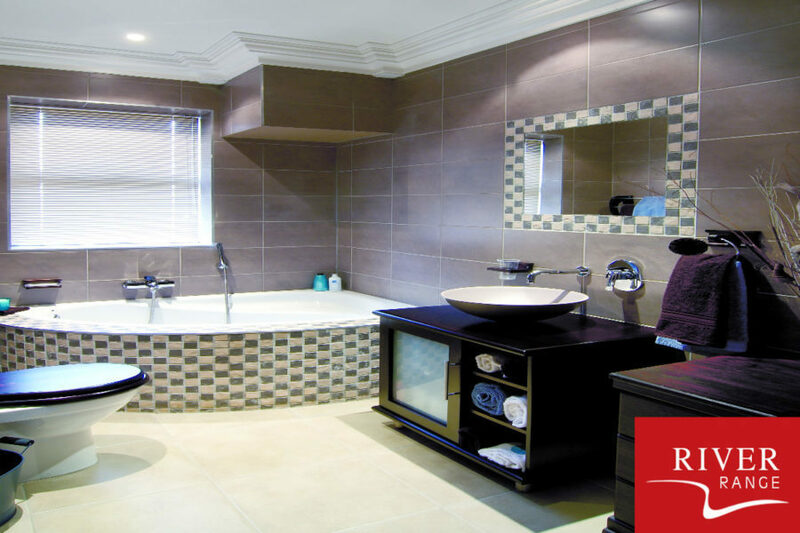 River Range is a top quality acrylic bathtub brand established in South Africa in 2011. Since then our brand has grown into a comprehensive range of bathtubs distributed to various countries in Africa. River Range’s bathtubs are made of the best cross-linked acrylic available on the market, ensuring a tough yet beautiful high gloss finish, each backed by a 10-year warranty as a testament to their quality and durability. Use our Store Locator to find your nearest River Range distributor. No matter how small your bathroom is, River Range has a modern acrylic bathtub solution that fits, and sets the tone for a refreshing bathroom makeover. Summer is slowly clearing the way for Autumn’s arrival, and with it comes a transformation that creeps into all aspects of our lives. As homeowners search to mark the occasion, often a bathroom transformation can rejuvenate your living space and motivate a fresh mindset and renewed positivity. In our previous Blog, we added our practical contributions to responsible Bath Water usage in S.A. with reference to the Day Zero crisis in Cape Town and beyond. We trust you’ve transformed your water usage habits and look forward to the benefit of lower Water bills and greener gardens going forward. Perhaps it is time to reward your diligence with a radical bathroom transformation that may just promote bathing time to the most satisfying and relaxing moment of the day. Transform your Bathtub into the Centerpiece of your Space. If you reminisce with your grandparents’ generation, they will remind you the cold freestanding tub in the middle of a gloomy bathroom was a far cry from luxury. This area of bathroom design has come full circle and is trending more than ever. Freestanding bathtubs are associated with tranquility, luxury, and serenity. Style and shape have morphed into bold and daring expressions by modern designers. Clear illustrations are evident in the Rio Grande and Rhine Slipper models from River Range’s Freestanding Bath range, incorporating a distinctive round slipper shape complete with thin edges. In addition to the stylish transformation, the choice of material, acrylic, ensures that your bathtub enjoys exceptionally heat retention, doesn’t scratch easily, is relatively lightweight and spotlessly maintained with little more than warm water and mild soap. Corners are undoubtedly the most under-utilized spaces in most modern bathrooms. When square meters are at a premium, many homeowners cannot equate the functionality, let alone the luxurious transformation, of investing time and resources into transforming this space. Truth be known, it is a lot easier than you think. Corner showers, sinks and vanity shelves regularly spring up in urban bathroom makeovers. With a natural right angle at your disposal, we believe a built-in corner bath is a seamless solution, which can turn your mundane bath space into a spa-like enclave. Citing examples such as River Range’s Euphrates and Parana models – freedom is allowed to play with shape while adding luxury, spaciousness and a whole lot more fun to your new favorite corner of the home. River Range bathtubs are a classic range of quality bathtubs manufactured from the best cross-linked acrylic available on the market. Available as Freestanding, Center, End and Corner built-in structure, each collection from the River Range series aims to strike a healthy balance between luxury and functionality. By now we all have a general idea of how much effort goes into a radical bathroom transformation. Allow your creative juices to flow, and enjoy the process. Browse our current Brochure today, while keeping up to date with product launches on our Facebook page. As Day Zero looms on the horizon in Cape Town, we are often reminded of our individual responsibility to cut our bathwater usage in the continuing onslaught of one of the driest seasons ever recorded in SA. In our previous article, we touched on methods for maintaining your acrylic bathtub. Within our Blog, we aim to add our voice to issues that expand beyond luxury bathtubs promoting responsible bathwater usage. At River Range, we receive a lot of feedback and tips regarding water consumption. In this article, we offer a few suggestions on how to best utilize the remaining bath water in your tub (known as grey-water) after each use. While Day Zero has gladly been pushed back to 9th July at the time of writing (Source: EWN), each one of us can play a part in ensuring that, through sensible bathwater re-usage, we may never have to face that ominous day when the taps run dry! Considering what we are facing, grey-water is far too precious to just throw down the drain. From now on, consider Grey-Water as ‘water you can use twice’. With bathwater providing a proportionate amount of our daily water usage, salvage what you need and consider using it to clean your floors and windows. Other uses extend to; watering household plants and handwashing clothes. Remember to use the bathwater in hygienic ways and take necessary steps to minimize any risk of contamination. Reuse Bathwater to keep your Garden in full Bloom. Nothing raises the ire of suburbia more than sprinklers in full flow during an extended dry season. If you, or your Grandmother, still have an old watering can that is stowed away in the garage, fill it up with your bath’s grey-water and tend to your grass and garden plants without connecting to any water mains. Not only does it promote responsible water-recycling, it may inspire your neighbors to change their habits and avoid stepping onto that ‘naughty list’ of Cape Town’s biggest water-wasters. Share the same Bathwater amongst Family Members. At River Range, we have specifically designed our bathtubs to ensure high heat retention. This means, your daily bath will stay warm for longer and can be enjoyed by more than one user. While it is not an ideal prospect for everyone and may involve tough decisions on who gets the ‘first dip’, it is a fantastic initiative to reduce your daily water consumption. Furthermore, the grey-water can be recycled for the household and garden chores mentioned above. River Range is top quality acrylic bathtubs made for you! Using the best cross-linked acrylic available in the market, River Range ensures luxury and quality with a 10-year warranty. We proudly offer acrylic bathtubs in a range of styles, including Freestanding, Built-in, and Corner Bathtub units. 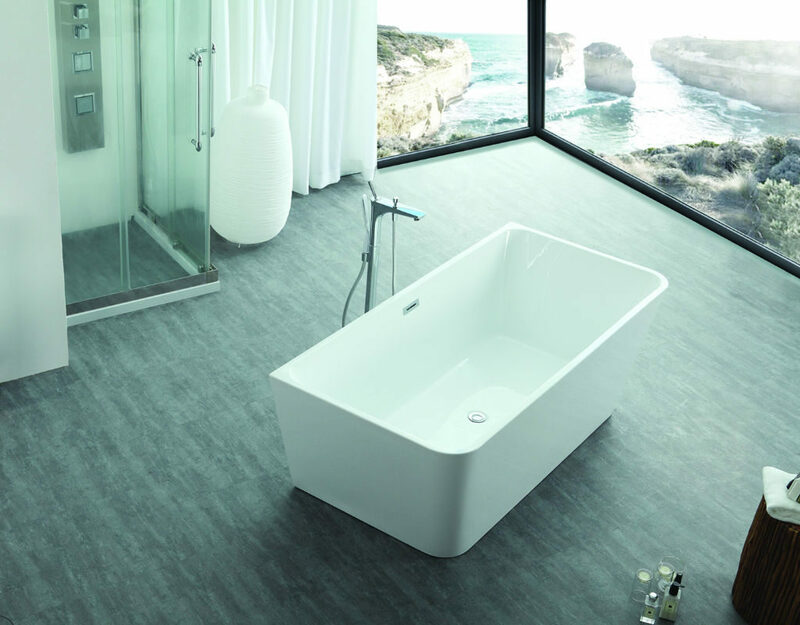 River Range bathtubs’ abilities to retain bathwater heat ensure that water usage can play a larger role in water conservation, providing a luxurious and economical bathing solution in the current climate. With a proven long service life, all River Range bathtubs are backed up by a 10 Year Warranty. Browse through our Catalogue today and identify the next luxury masterpiece for your bathroom. Whether you have purchased your dream home, or have set your mind to that long overdue renovation, you will have inevitably been inspired by the idea of remodelling your bathroom space with acrylic freestanding bathtubs design. The best news is; not only do acrylic bathtubs give your bathroom a beautiful and luxurious facelift, they also offer style, sophistication and functionality at an affordable price, complemented with matching taps and toilets. Put simply, one can save thousands, while acquiring a natural finish aesthetic. Innovation in bathroom design has come a long way in recent years. Designers, architects and manufacturers understand the homeowners’ desire to escape to the tranquillity of their bathing retreat, soaking away all the stresses of the outside world. However, not many of us possess the interior budget of a five-star hotel. With the emergence of acrylic freestanding bathtubs, one can completely transform the bathroom into a functional and aesthetic space at a fraction of the cost. As a budget-priced option for bathroom renovations, acrylic bathrooms offer a host of advantages. Here are our Top 3 Benefits of choosing acrylic as your freestanding bathtubs material of preference. For everyday use, prospective buyers of bathtubs, taps and toilets will be encouraged to know that acrylic surfaces are generally stain resistant. They can easily maintain their beautiful glass-like finish over a lifespan of 30 years plus, with regular care and maintenance. As a lightweight solution, acrylic tubs perform surprisingly well at retaining heat. Its thermal qualities allow warm water to maintain its warmth without a quick loss of heat through the acrylic and fibreglass walls and base. Something you might not know about acrylic is that the colouring process takes place while the product is still in its raw mould state. With the absence of an outer coat of paint, the colour is evenly distributed, maintains its beautiful shine, and will not fade over time. With a long history in manufacturing and an acute understanding of the market, River Range excels at offering the customer a superior quality product at competitive prices to serve the market more effectively. River Range offers a comprehensive range of high quality (10-year warranty) cross-linked acrylic bathtubs – available as Freestanding Bathtubs, Corner tubs and built-in bathtubs with shower trays. River Range strives to give the customer a full solution and to make the choice of choosing your designer bathroom as easy as possible, by recommending suitable taps and accessories to complement each bathtub. Browse through their selection of products here. As summer quickly approaches, it marks the season where we build in new commitments and objectives for the year ahead. When that attention is drawn to making our house a better home, the bathroom, often the smallest room in the house, should list high on your renovation priorities. With the latest trends in modern bathtubs bringing a heightened luxury and adding inspiration to a previously drab space, the fitting of built-in baths into your bathroom can dramatically improve home decor and aid relaxation, while never compromising on functionality. Contemporary built-in baths are all about adding to the natural light of the space, enriching your room with a luxurious feel, while carefully selecting the shape and positions of your bathtub and taps to give a beautiful aesthetic appeal. With acrylic materials, designers have been able to experiment with shapes to produce built-in bathtubs inspired by the wonders and customs of the world. This is particularly evident in the River Range collection of luxury centre and end drain bathtubs, aptly named after the iconic rivers of the world. Each is as individual as the geographical area they represent and are built-in with flat edges to create ample surfaces to add stylish decorating to the room. Unlike natural and stone materials, acrylic bathtubs can also be custom-made to accommodate taller and larger proportioned bodies. Nobody in the family should be left out, even those with tall genes! Corner’s are generally the least used space in most rooms of the house. However, when working with a small space, utilizing the corner can optimize other areas and solve many storage problems. In the same way, a built-in corner bathtub can become a fantastic option, allowing you to save space without giving up comfort. With a built-in bathroom focused on a corner bathtub, it truly allows your decorative juices to flow. More attention can be paid to stylish storage solutions. You can potentially create extra room to accommodate a shower. The possibilities are endless. River Range bathtubs are a classic range of quality bathtubs manufactured from the best cross-linked acrylic available on the market. Available as Freestanding, Corner and built-in baths, each collection from the River Range series aims to strike a healthy balance between luxury and functionality. Durability is never compromised and backed up a 10-year warranty on all our products. Best of all, River Range is exceptionally priced to ensure any customer can realize their dream built-in baths vision, without breaking the bank. Browse our current Brochure today, to get a step ahead of those summer renovation plans!